Vipassana was one of the hardest things I have ever done. 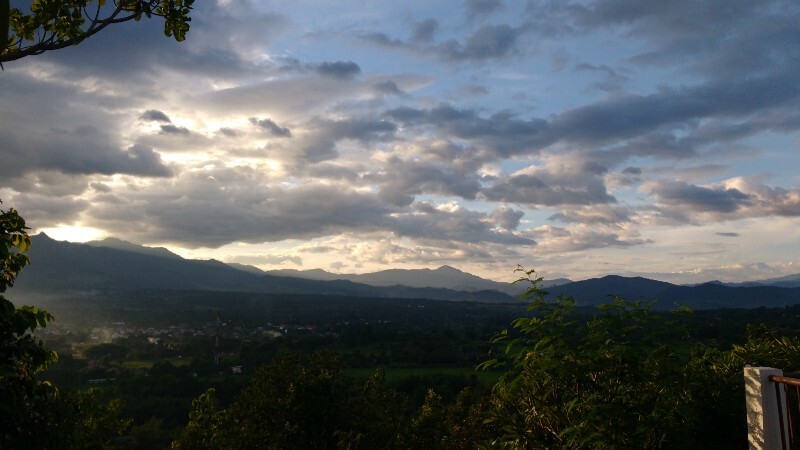 Below you will read about my full experience of the 10 day Vipassana course I did in Vietnam. The raw thoughts and emotions, everything that went through my mind, what I enjoyed, what I hated, what I learned in the end and how I felt afterwards. Everything that the body perceives through its five senses and the mind is registered as raw data (consciousness). The mind will then evaluate and put a label on the experience and determine whether it is positive or negative (recognition). At the same time, sensations will start to appear on the body. As long as there is no label on the experience, the sensations will remain neutral. But as soon as a label is assigned, be it negative or positive, the sensations change accordingly. If the label is positive, the sensations will be pleasant and the mind will start craving to prolong or intensify this experience. Is the label negative, the sensations will be unpleasant and the mind will react with aversion. A question that arose during the 10 day course was that when we train our mind and body not to react to the sensations, won’t we become a robot without emotions? We won’t. Being balanced and aware of your sensations gives you the opportunity to react to any situation in a sane way with calm and clarity. With the awareness of all sensations you then invite love and compassion into your live. My day started by waking up at 04.30 in Hanoi. Finishing a month long motorbike adventure through Vietnam with a good friend I had to catch a flight the same day Vipassana would begin. I was still busy reading emails and articles about finding my path, my dream job for the entire day before reaching the centre where I had to hand in my phone which was not to be touched for the next 10 days. After registration I had some hours to kill before the course would start and I would spend my time talking to people which helped with getting rid of the nervousness I felt in my stomach since that morning. at 17:00 in the afternoon we were served a vegan meal and this would set the tone for the coming 10 days. Every meal was vegan and turned out to be very delicious. Actually so good it was something that brought up some old struggles as you will read later on. All alone with my thoughts. No communicating in any form. The next 10 days should be experienced as if you were alone. A lot went through my mind and this was going to get worse day by day. My mind would find any form of distraction just so I was wandering from what I was supposed to do. Focus. focus on my breath coming in and going out. How did my meditation go on the first day? Terrible! A lot of pain and shifting in the hope I would find a more comfortable position. Every time the mind would wander during meditation, we should bring our attention back to the breath without getting irritated. This turned out to be a challenge already because I would get annoyed too quickly. I wanted to do it right and stay focussed but when I would notice my mind wandered I would get irritated which only made things worse. I would start saying to myself “Stop wandering and do what you have to do. Focus Rens, Focus!”. And of course talking to myself meant I was not focussing on my breath. It is weird… you can get lost in thought for a while and when you notice you are lost in thought you feel like waking up without ever being asleep. It is the awareness that I am lost in my thoughts that gets me out of this unconscious thought loop. After 4 days we started training Vipassana. The first three days are focussed on sharpening the mind so you can notice sensations on the body. We were now supposed to scan our body for sensations. Going from head to toe, scanning a part of the body for some minutes and then moving on to the next. You observe the sensations for what they are without creating craving for pleasant sensations or aversion for unpleasant sensations. They teach you to observe with the knowledge that all sensations are impermanent. That warmth, pulse, tickle you feel now is gone the next time you scan the same area but there might be a new sensation right next to where the old sensation was. We were now also not allowed to change posture during the group meditation hours. A whole hour without moving. The pain never stopped and would only get worse. Hours seemed to take longer than ever and all I could do was bite through the pain and try to focus. My mind would say “I cannot do this! it is too painful. Let your body rest a bit and then continue”. Why were we not allowed to move? to strengthen the mind and train us to be persistent. The worst thing was when I gave into my mind and change position or open my eyes. I would feel bad and get angry at myself because I could not even last one hour. Then I would convince myself that next hour I would be persistent and not move. After a 5 minute break would enter the meditation hall full of confidence. But then after 20 minutes my mind would start talking again about giving up and I knew this was going to be a long hour. It is not so much the pain that would make me give up, you eventually get used to it. It is the mind finding sneaky ways to convince you that you are allowed to take a rest or shift posture. I would tell myself “I am unable to focus while sitting in this posture, surely if I shift in a more comfortable posture I can focus better” but that one time I gave into this thought I noticed of course this was just a trick. 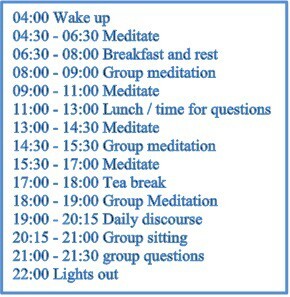 There is also a big difference in meditations throughout the day. That first time I had a great meditation with little pain I got all happy and thought “yes! now I know how to meditate”. I thought next hour would be good as well but nothing could be further from the truth. I would sit down happy for 5 minutes and then the pain starts again. Then I would get irritated again, and everything starts all over. My mind was constantly trying to find ways to count down time. I roughly knew how long it would take for me to scan my entire body so I knew that the hour would almost be over by the time I had completed three body scans. Or when the teacher would call small groups of 6 to the front of the meditation hall to ask whether they had understand the teaching. I would be counting the groups until it was my turn. And the worst thing was when I found out there was a clock in the meditation hall! My mind would keep trying to convince me to look at the clock. And the times I would give in I would get angry with myself. Day 6 turned out to be one of the toughest days. My whole day was negative. My meditations were not as good as I wanted them to be. I shifted positions a lot, opened my eyes and kept getting more and more angry at myself for this. Old negative thought patterns came up which were hard to deal with. I was again negative about my looks. Getting angry with myself again when I ate too much for breakfast and lunch and feeling fat. I started looking around the hall during meditation and everyone seemed to be in perfect posture meditating without trouble. I started to compare myself with other people as I used to do some time ago. I started talking negative to myself. “you are wasting your time here. You are not focussing or doing what you are supposed to do. and now you opened your eyes and shifted posture AGAIN!” old memories of fights or arguments came up, I start replaying them in my mind which makes old emotions come up as well. I felt like I failed and wanted nothing more than book a plane ticket home. Also the ideas about starting my own company are out of the window. I said to myself that I was unable to ever do this. I started doubting my own skills. Luckily the discourse that night cheered me up a lot. In the video S.N. Goenka (the current teacher and founder of the Vipassana centres) talked about everything that had happened today. The negativity, opening my eyes, changing posture, counting down time, eating too much because it is so tasty. I started laughing. Feeling relieved that I was not the only one experiencing all the negativity. Day 7 I was all positive again. But this positivity was different because I knew that this did not mean my meditation would go any better than yesterday. Or that my mind would all of a sudden be at complete rest as if I had found enlightenment. Far from it. But knowing this of itself already created a sense of calm within me. The meditation sessions that day alternated between good and bad. But I was not getting as annoyed with myself when having a bad meditation and I was not holding on to an earlier good meditation. Though there was still something that could trigger irritations within me… The last days of the course, S.N. Goenka started talking about “sweeping” the body in parts where you could feel subtle sensations. Or even sweep the entire body when you felt subtle sensations all over. Once again I started thinking I was doing something wrong because I did not have the subtle sensations all over my body and was unable to “sweep”. Did I not progress as quick as the other students? Where did I go wrong? After talking to the teacher it became clear that progression is not measured by the amount of sensations you feel but by how calm or equanimous you stay while observing the sensations. The calmer you stay the more sensations you begin to feel with proper training and time. Everything that happened around me could be seen as a test of my equanimity. The people that irritated me because they weren’t taking the course serious and started talking after 5 days. The dogs outside that were barking during meditating hours. The students that coughed in the meditation hall. The snorting of other students. The champing during eating. One day I don’t notice it at all and the other day I get irritated by the slightest sounds. Then I started thinking, I have no control over the situation and I am only making it harder on myself. I created my own misery. The only thing I could do is accept it. As soon as I started accepting the situation I regained a sense or calm and focus. The last 3 days we were given the instruction to start observing sensations outside meditating hours as well and I saw this as an opportunity to observe what I feel and thought during breakfast and lunch. Before this instruction I already noticed I started thinking about the food before meditation was over and could not focus on my sensations any more. As soon as the bell rang I got nervous. I did not want to be too late for the food. I did not want to be in the back of the line. I was scared that I wouldn’t have enough to eat which resulted in taking extra food on my plate. The days I stood in the back of the line I noticed my thoughts going “Do not touch my food!” and I noticed I got angry at the other students. Observing this actually made me scared of my own thoughts a bit. But I tried to remain positive and was happy I actually observed it and not let my mind lead me too much. The fun thing about Vipassana is that there is so much time to think that I actually started thinking about a project I want to start when I return home. I had a rough idea about what I want to set up but still had a lot of questions that were unanswered. During one of the meditation hours it was like I had a brainstorm session and answers to these question started coming up and the idea kept growing up to a point that it is now a very realistic idea and get excited when thinking about starting this project. I also started thinking about all the good things I have at home and everything that had happened to me during the months of travelling (I am currently travelling through South-East Asia for 6 months). It made me appreciate all the things I have and everything that I had experienced that made me into who I am today. Of course I started missing my friends and family but I did this with a smile, knowing that in some time I would see them again. After Vipassana had ended I noticed I was a bit scared to return to Ho Chi Minh City. The Vipassana centre was a very safe environment in which you can face all the negativity of your own thoughts but going outside on your own to do it alone was a scary thought. But as we were taught this week this feeling lasted only for a short time. 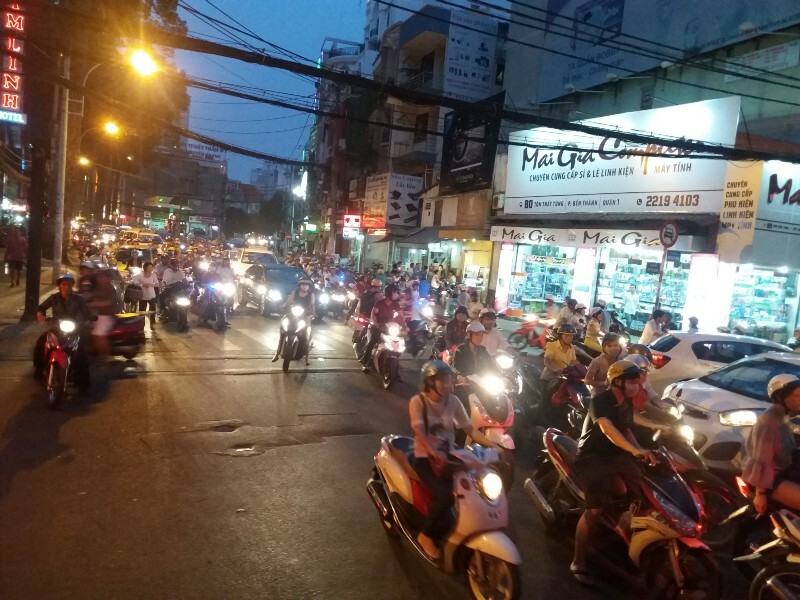 Upon returning to Ho Chi Minh City it was like everything was going a lot quicker than I was. I observed everything around me and it all seemed so much more vivid. It was like that first day I landed in Bangkok 6 months ago. Feeling like everything was new. The people, the houses, the tastes, all the different scents of street food, garbage, incense. Sometimes I forget where I am, travelling for months become like normal and I tend to notice the differences less the more I travel. It feels like normal life, going from one place to the next meeting so many people. But this was a good reminder of where I actually was and made me take the time and appreciate where I am more. After spending 10 days training my mind to focus on the breath and sensations I now quickly realise when my mind has wandered away. This allows me to focus on whatever I am doing for a longer period of time and quickly regain focus once I noticed that my mind has wandered. This also helps me to recognise emotions and thoughts. I can observe my thoughts without reacting to it or clinging on to them. I see that my mind can be very scattered but I do not get lost in them because I know the mind never stops. Thoughts come and go but I no longer put any attention into them unless when I want to focus my thoughts. I can observe my emotions better for the same reason. I observe whenever I have an emotion and recognise which emotion it is and then try to feel the sensations without letting the emotion control me. This all creates a sense of calmness. Being able to observe without reaction allows me to stay calm. I have less emotional ups and downs because they do not control me and this allows me to take decisions with a clear and positive mind instead of making decisions when I am over excited or very angry. I learned to accept that change is the only constant. Of course a positive experience will still make me happy. But I stop holding on to the experience knowing that it will pass and allows me to enjoy it in the moment. Now, when I encounter bad situation or just have a bad day, I try to remind myself that this too will pass. This makes the bad more bearable. I compare less knowing that everything changes. I compare new experiences less to older experiences. The new experience can never be the same as the old one and I start to appreciate the experience as it is. This helps me to see new experience as an experiment rather than set expectations based on previous experiences. I compare myself less with other people as well. Talking to the other Vipassana students afterwards, I learned that I might be in the same situation, doing the exact same thing, but their experience is completely different. This means their outcome of this experience will also be different. All this allows me to live more in the present. Experiences, emotions and thoughts come and go. I cannot change the past so I stopped worrying about or over thinking something I had done. The future is yet to come. The only moment I can act is now. The only moment I can truly enjoy an experience is now. When meditating hours and hours on end, I learned that I can do a lot more than my mind will often tell me. All those hours of pain and suffering without moving and just observing have taught me that even in bad times, if I just push through, a positive period will come. I can use this persistence in daily life. Pushing through the bad will often lead to an even better outcome. As best learning moments always come after a tough or difficult challenge. This also helps me to challenge and push through my fears to experience new things. Allowing my emotions to be. I used to be very hard on myself. Comparing with others and pushing myself down if I hadn’t achieved the same results. Or not allowing myself to be angry because I thought this was a “bad” emotion. Meditation allows me to see my emotion how it is and accepting that I feel this way in that exact moment. I go to my sensations, observe them and know it will pass but I do not try to suppress it. Definitely. It helps me in many different ways. I am much more aware of the things that happen around me. But maybe even more important. I am much more aware of what happens inside me, my emotions, my thoughts and my sensations. I am aware whenever I am stuck in a worry loop and then briefly focus on my breath or sensations to get out of this loop. The focus I gain from meditating is very useful when working on a task and allows me to continue working without distractions. Like writing this article. There is so much focus that nothing around me bothers me or drags my attention away from what I want to do. Meditating also helps me with my sleep. In the past I always needed something to distract me whenever I wanted to sleep because I was scared to be alone with my thoughts. I would not be able to sleep because as soon as I would be in bed the worries would start pouring in or my mind would be restless all the time. Either stuck in the past or future. I needed to watch a series on my laptop until I fell asleep. Later this turned to reading a book (huge improvement!). And now all I do is observe sensations, observe my breath or observe my thoughts. This allows me to go to bed without worries and I sleep a lot deeper and wake up more refreshed. I Hope this post has motivated you to start exploring meditation as a way to explore yourself. Even if it is only 5 minutes after waking up and before sleeping. Give it some time and you will start noticing small changes. And when you feel ready you can increase the length of your meditation. There are enough resources out there to help you! If you liked this article, please let me know what you think and share it with your friends!